^ Kangaroo Island Long Term Ecological Research Site. The Australian Department of Agriculture, Fisheries and Forestry. [2009-03-06]. （原始内容存档于2008-09-06） （英语）. ^ Climate statistics for Australian locations. Bureau of Meteorology, Australia. [2009-03-07] （英语）. ^ Tensions ease as cost is counted. The Islander. 2007-12-20 [2009-03-07]. （原始内容存档于2012-07-09） （英语）. ^ Island on alert as crisis continues. The Islander. 2007-12-13 [2009-03-07]. （原始内容存档于2012-07-10） （英语）. ^ Rebe Taylor. Unearthed: The Aboriginal Tasmanians of Kangaroo Island. Kent Town: Wakefield Press. 2002. ISBN 1-86254-552-9 （英语）. ^ Collection Item Transcription: A VOYAGE TO TERRA AUSTRALIS (South Coast, Kanguroo Island). State Library of South Australia. [2009-03-06] （英语）. ^ Australian history recast: COLONIAL HISTORY; In the beginning (The Advertiser, December 13, 2002). History News Network. [2009-03-06]. （原始内容存档于2009年2月2日） （英语）. ^ 2006 Census QuickStats : Kangaroo Island (DC) (Local Government Area). Australian Bureau of Statistics. [2009-03-06] （英语）. ^ Bottled with Pride. Kangaroo Island Gateway Visitor Information Centre. [2009-03-06]. （原始内容存档于2009-02-27） （英语）. ^ Council Information. Kangaroo Island Council. [2009-04-03]. （原始内容存档于2009-05-18） （英语）. ^ Recent Updates. Government of South Australia, Department of Planning and Local Government. [2009-04-03]. （原始内容存档于2009-03-09） （英语）. ^ Development Act 1993 (Consolidated - 30 October 2008) (PDF). Kangaroo Island Council. [2009-04-03]. （原始内容 (PDF)存档于2009年5月23日） （英语）. ^ Andrea Smith. The maritime cultural landscape of Kangaroo Island, South Australia: A study of Kingscote and West Bay (PDF). Flinders University. 2006年6月 [2009-03-07] （英语）. ^ Loading sheep at Kingscote Jetty. State Library of South Australia. [2009-03-07]. （原始内容存档于2007-09-06） （英语）. ^ Summary of R.W.Miller & Co. Newcastle Regional Museum. [2009-03-07]. （原始内容存档于2007-10-12） （英语）. ^ State Opposition statement attributed to Ted Chapman MP. The Advertiser. 1987-08-26 （英语）. ^ SeaLink Travel Group Information. 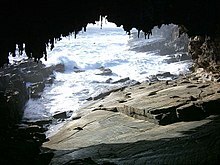 Kangaroo Island SeaLink. [2009-03-07]. （原始内容存档于2009-03-21） （英语）. ^ KI Ferries expected to be operating by week's end. ABC News. 2007-07-30 [2009-03-07] （英语）. ^ Fuel price leaves KI ferry high and dry. The Advertizer. 2008-05-22 [2009-03-07] （英语）. ^ Ferry for sale. The Islander. 2008-06-19 [2009-03-07]. （原始内容存档于2012-07-10） （英语）. ^ Kangaroo Island residents unhappy about ferry agreement. ABC News. 2002-08-07 [2009-03-07]. （原始内容存档于2009-09-26） （英语）. ^ Air Charter Flight & Air Charter Services. Air South. [2009-03-07]. （原始内容存档于2009-03-04） （英语）. ^ Dog and Cat Management Plan 2005 (PDF). Kangaroo Island Council. [2009-03-07]. （原始内容 (PDF)存档于2009-05-18） （英语）. 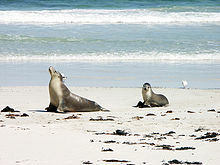 ^ Wildlife on Kangaroo Island. South Australian Visitor & Travel Centre. [2009-03-07] （英语）. ^ Visitor Exit Survey (2006/2007) (PDF). TOMM KI Committee. [2009-03-07]. （原始内容 (PDF)存档于2008-07-20） （英语）. ^ Gifford D. Chapman. Kangaroo Island Shipwrecks. Roebuck Society Publications. 1972. ISBN 0-909434-01-8 （英语）. ^ Coastal Activities - Diving. Kangaroo Island Gateway Visitor Information Centre. [2009-03-07]. （原始内容存档于2009-03-03） （英语）.